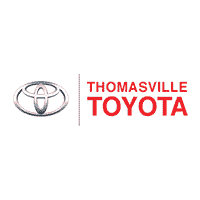 When you purchase a new Toyota from Thomasville Toyota you will benefit from our 20 Year/200,000 Mile Warranty. Standard on all new, untitled vehicles 0-5,000 miles sold at Thomasville Toyota, our 20 year/200,000 Mile Warranty covers multiple aspects of your vehicle. It is a Powertrain Limited Warranty that covers: your vehicle’s Engine, Transmission/Transaxle/Transfer Case, and Drive Axle. For each repair visit, there is a $100 deductible as well as any costs uncovered by this Limited Warranty. This Limited Warranty is NON-TRANSFERABLE and expires the day the vehicle is traded, sold, declared a total loss, and/or any changes of ownership. When repairs are required, if possible, return your vehicle to the dealer. If you cannot return your vehicle to your dealer, you must telephone FWS at 1-800-327-5172 during normal working hours to receive instructions. To find out more about our 20 Year/200,000 Mile Warranty, see dealer for copy of limited warranty. For more details on this warranty please contact us anytime at 229-228-0555.